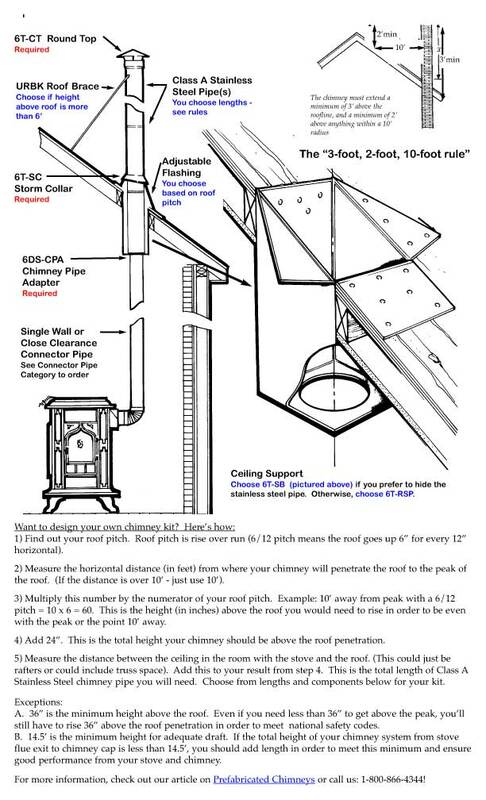 This chimney kit details the pieces you would need to pass through a pitched or cathedral ceiling, any attic space or truss space, and terminate above your roofline. See the Connector Pipe category for selecting pipe to go between the stove and the ceiling. Please refer to the article "Prefabricated Chimney" for a detailed explanation of how to plan and install your chimney kit. Please call 1-800-866-4344 for availability. PLEASE NOTE: We will not ship 4' lengths of chimney pipe via UPS due to damage. Complete chimney systems also will not ship via UPS but rather via motor freight to either the truck terminal that services your zip code, or, to a business with a loading dock or forklift, assuming you get their permission to do so. Please call 800-866-4344 if you have questions or need a shipping rate. The Chimney Pipe Adapter allows you to transition from MetalBest Class A Stainless Steel pipe to either single wall or double wall (close clearance) pipe. Finishing collar provides trim at connection between stove pipe and stainless steel pipe in installations where stainless steel pipe is visible in the living space. Painted to match stove and stove pipe color. The Support Box is used to provide required clearances and support for stainless steel chimney in cathedral ceilings or mobile home installations. It includes a trim collar to cover cut-out in finshed ceiling. Can be painted to match stove and stovepipe if other than black. This trim piece provides a finished look around the stainess steel pipe on a pitched ceiling. For ceilings with pitches from 2/12 to 6/12. This trim piece provides a finished look around the stainess steel pipe on a pitched ceiling. For ceilings with pitches from 6/12 to 12/12. Seals penetration where pipe passes through roof. Use in conjunction with Storm Collar (Part 6T-SC) to seal between flashing and vent pipe. For roof pitches from 2/12 to 6/12. Flashings for steeper pitched roofs are available. Seals penetration where pipe passes through roof. Use in conjunction with Storm Collar (Part 6T-SC) to seal between flashing and vent pipe. For roof pitches from 6/12 to 12/12. Other flashings are available for other roof pitches. Seals penetration where pipe passes through roof. Use in conjunction with Storm Collar (Part #6T-SC) to seal between flashing and vent pipe. For steep roof pitches from 12/12 to 24/12. Seals penetration where pipe passes through roof. Use in conjunction with Storm Collar (Part 6T-SC) to seal between flashing and vent pipe. For roof pitches from 24/12 to 36/12. Other flashings are available for other roof pitches. Used to seal penetration where pipe passes through a flat or low pitch (up to 2/12) roof. Use Storm Collar, Part #6T-SC (sold separately) around pipe above flashing for leakproof installation. Can also be used for sealing chase tops. 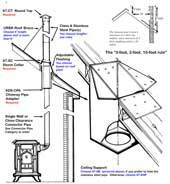 The Roof Brace Kit is required if pipe extends more than six feet above roof or in areas of frequent high winds. The Interior Resupport is required to support the chimney pipe in a diagonal pipe run in the building. Collar is tightened around the pipe and attached to framing. A round chimney cap tops off your installation to keep out rain, snow, leaves, and birds. Has lower skirt to deflect wind. Storm Collar slips around chimney pipe just above roof flashing to keep out rain and snow. Attaches with tab and slot system. Stainless steel wire mesh screen attaches to Round Top Chimney Cap to prevent sparks from traveling up and out of chimney. Required in Mobile Home installations. MetalBest stainless steel 15 degree elbows can be used to redirect pipe around obstacles in the building. Interior Resupport is included to bear weight of offset pipe. 30 degree elbows are also available (Part #6T-EL30K). MetalBest stainless steel 30 degree elbows can be used to redirect pipe around obstacles in the building. Interior Resupport is included to bear weight of offset pipe. 15 degree elbows are also available (Part #6T-EL15K). Supports chimney in Cathedral Ceiling installations where customer prefers not to use the Support Box. Roof Support Package contains 18" length of stainless steel pipe with roof brackets and hardware. Used in conjunction with Pitched Ceiling Plate to trim opening in ceiling. Class A Stainless Steel pipe rated to 2100Â° for use with high efficiency wood stoves. Requires only 2 inches of clearance to combustibles. All components twist lock together for a secure system. Six inch diameter pipe is suitable for all our stove models.